For all intents and purposes, the Holyoke Mall at Ingleside is–at least for the moment–the largest mall in New England. It will soon be eclipsed by the Natick Mall, which is nearly doubling in size, and technically, the Northshore Mall in Peabody, Massachusetts is the largest shopping center in sheer square footage. However, Northshore’s floorspace is tucked into its five massive anchor stores, two of which are currently dark, while Holyoke Mall is a true giant. 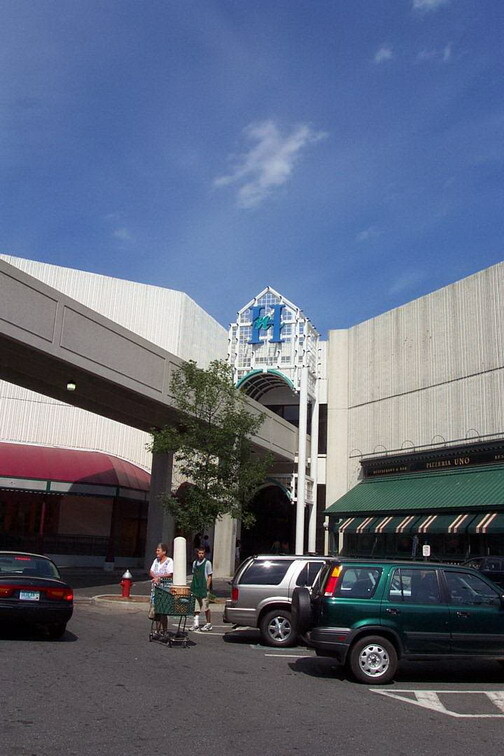 Developed by the Pyramid Companies of Syracuse and opened in 1979, the Holyoke Mall was designed as a dominant mall to serve not only the metropolitan Springfield region of Massachusetts, but also to serve as a major regional draw bringing customers from all of Central and Western Massachusetts, Connecticut, and many parts of New Hampshire and Vermont. The 1.6 million-square-foot, 200-store, three-level mall is strategically located near the junction of interstate 90 and interstate 91, just northwest of Springfield. Despite that the mall received a minor renovation in 1995, it mostly stands as a monument to 1979, in all the best ways. The grand, three level center court, complete with wood paneling and concrete stairwells, is a charmingly gauche relic of another era. Also, the mall sports some unusual anchor stores, including Christmas Tree Shops, Target, AC Moore, Best Buy, Babies ‘R Us, and DSW Shoe Warehouse along with more typical mall anchor tenants such as Macy’s, Sears, JCPenney, and H&M. The Holyoke Mall has one major anchor vacancy in the form of a vacant Lord & Taylor which closed in 2004, and some past anchor tenants include Lechmere, Nobody Beats the Wiz (a rarity for Massachusetts), G. Fox, Filene’s, Steiger’s, Service Merchandise, Filene’s Basement, and Kids R Us. 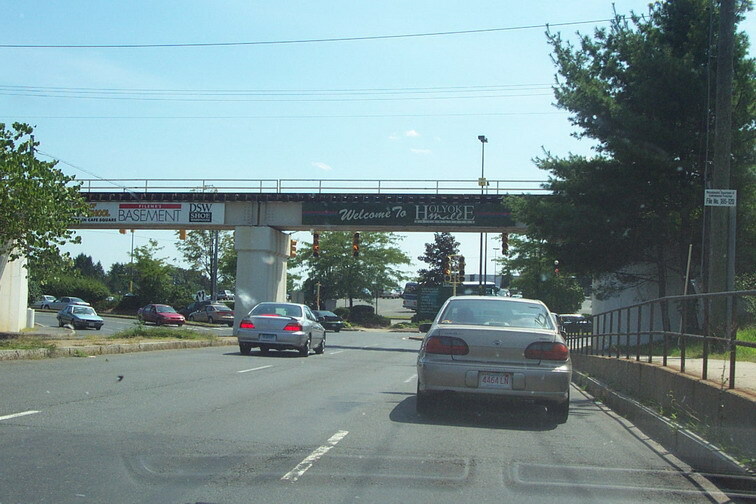 Metropolitan Springfield is home to approximately 600,000 residents, though the Holyoke Mall pulls from many rural areas for hours around. Still, it’s inevitable that a mall this large would wreak serious havoc in a mid-sized metropolitan area, and it did: The Fairfield Mall in nearby Chicopee shut in 2001 after years of decline; the Baystate West/Tower Square Mall in downtown Springfield has been reduced to little more than a food court; the Hampshire Mall in Hadley (which serves the Amherst/Northampton area) succeeds mainly on the strenth of its anchors, but its interior is lagging; and the Eastfield Mall in Springfield has had major ups and downs over the years, even if it’s on relatively solid ground at the moment. 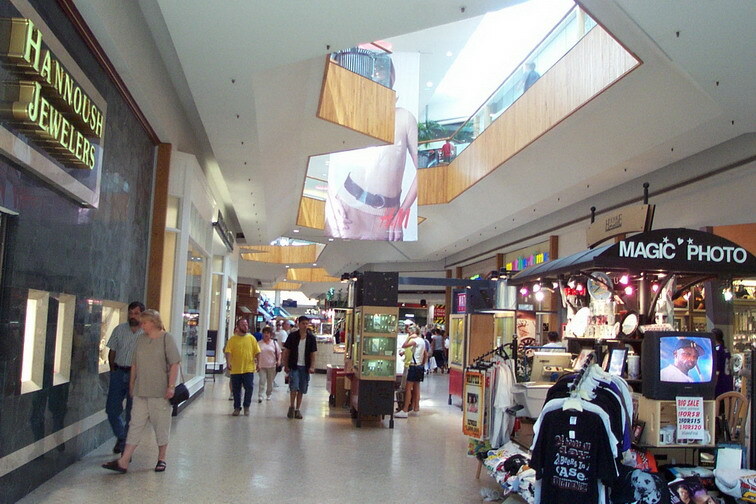 The Enfield Square Mall, just over the border in Connecticut, also suffers from a relatively uninspired tenant roster despite anchoring one of the most successful retail districts in the Springfield area. All photos taken in 2001 by Prangeway. Find a more recent set at The Caldor Rainbow! This makes Natick certainly bigger than Holyoke, but even further, Northshore will actually be losing square footage as the 300,000 sq. ft. Macy’s is razed for a 144,000 sq. ft. Nordstrom. I love the old school radio shack logo. 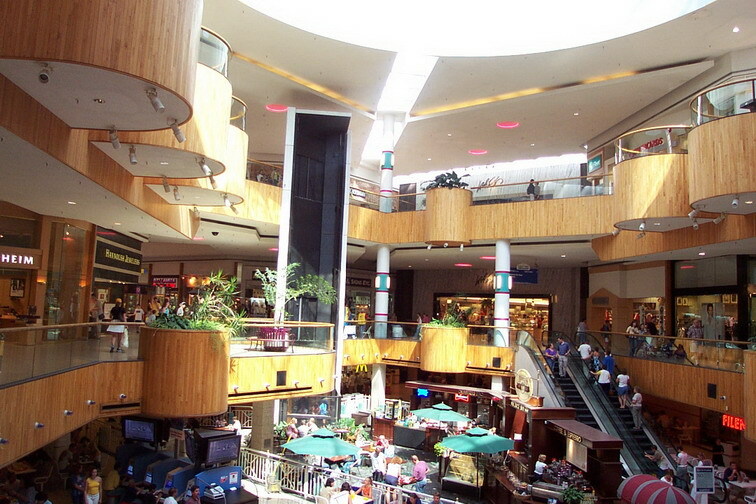 Nice article and pics, Holyoke Mall is definitely stapled for it’s early 80’s design and space-aged wooden trimmed flower pots and such. I do normally use a camera phone for that very reason (I hate being yelled at, plus they’re now of the quality where I’m OK with using it for this purpose) but Ross took these with a real camera, like he always does. He managed to get away with it somehow, though it was 5 years ago. I notice that the blue Holyoke Mall sign on the outside of the building seems to be in the same font as the credits for the Mary Tyler Moore Show. Say, NJYogi, you made the same observation as *that bloke* on the Caldor Rainbow. I noticed that too. Could you say that this mall made it after all…. Now that’s a cool looking mall! I love the floor plan, too. They won’t let you wear clothes deemed offensive (or go naked). I wonder if they have a list of “offensive” clothes, since just about anyone will find something objectionable at some point. And for god’s sake, no yelling!! Is this a “quiet” mall? Who makes this stuff up? I got yelled at for taking pictures of this mall 4 years ago. @dan fife, They recently reopened a toys r us express while not as great as a big toys r us it’s better then nothing.as for L&T? I don’t know. Lord & Taylor didn’t make it a lot of places, actually. In the late 90s/early 00s they probably overexpanded, and the timing was particularly bad as the brand’s value (in most consumers’ eyes) wasn’t quite as special and upscale as it had been in years’ past. I think that they actually benefited more by having fewer stores concentrated near major metropolitan areas and acting as a destinational store than when they started opening stores in smaller markets like Springfield and Providence. Also, the Springfield area is relatively blue-collar, and Lord & Taylor still skews pretty upscale, so I’m sure that didn’t help. I see that they are bringing in a junior anchor with Sports Authority taking the space formerly occupied by AC Moore and Kahunaville. They’re in kind of a pickle with the Lord & Taylor store because there really are no other prospects in bringing in another department store unless it was something along the lines of Bon-Ton or Boscovs. But since this is Pyramid Corp.’s top-performing mall it probably won’t sit empty for much longer. To tell you the truth, I’m surprised Lord & Taylor lasted as long as it did because it seemed to be a ghost town from day one when it opened. Based on the couple of times I went in there it seemed to overlap too much with Filene’s and I think that’s part of the reason it didn’t do well. Yes, the Springfield area is a blue collar area but you’d be surprised, there are some extremely wealthy areas (Longmeadow and up in Hampshire Counties), so that’s why they can bring in/expand some upscale stores and they will do well. Also, Holyoke Mall was one of the first malls of the country to get an H&M (opened in Summer 2000) so that just goes to show you that this is a fairly important mall to retailers. If the mall is still holding strong right now in 2007 I think this mall will continue to thrive unless another mall of this size is constructed in the Springfield area. I was just wondering if there is a place my wife and I can look up all the stores that have come and gone? We are trying to remember the ice cream place that made the waffle cones in the early 80s, and where it was located. @mike, Brighams Ice Cream ? I vaguely remember a waffle cone place being somewhere on the second level. Not sure where, I think it was near the old G. Fox anchor (the one that’s now L&T). I remember that comics store you were talking about. I think it was around until the mall expanded. 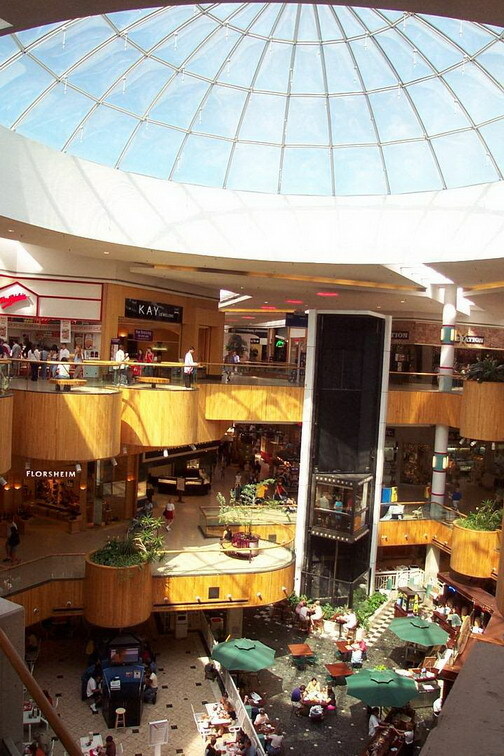 I also remember that mall used to be pretty grimey looking before the expansion happened. I remember there used to be a water fountain down by JC Penney which they probably took out in the mid 90s when the new part of the mall opened. That really seemed to be the turning point. After that time, they started bringing nicer, more expensive stores in the mall for the most part (save Target). I would love to know what stores that are in the mall now have been there since day one (besides the department stores). I just went by the mall today and took about 100+ photos of it which I’m going to present on my Yahoo albums probably tomorrow or so. Luckilly, I managed to slip right past security although I had a very close set of encounters. Here’s what I remember about the mall; it’s decor has barely if at all changed over many years. As far as I know, the wood-paneling has to be original and the mall entrances are draped with similar wood-panels like ones between the levels. When I was a kid, I remember there used to be white-colored, hanging signs where they’d arrow point you to all the anchors. They still have them, albeit updated to blue and white. There was also a Burger King (possibly with an interior seating area) in the Cafe Square where Wendy’s is currently, not sure when it closed. That comic book store was, at least in its latest years, located upstairs closed in 2005, shortly when the mall started changing a lot, a creating a much more upscale environment. I went there for the last time when I came here for one of the first times in years. This mall has changed greatly, tenant-wise, over even the past couple years while there are still some moldy oldies here (like Sterling Optical and its mirrored facade). I’d kill to see some vintage photos of Holyoke Mall. This one’s been with me since I was a very young lad growing up in the 1990s. I’ve got fond memories, and this mall still retains much of that vestigial charm. Here’s some historic ads from when the mall opened in July 1979 and a full gallery of pictures from April 2007. The mall is great, but it’s too bad it’s not the largest in NE anymore. You were right. It’s pronounced “Holy-Oak”. @Jonah Norason, I’ve found “Hol-yoke”? This is incorrect. Prior to becoming Lord & Taylor in 1994, that location was a Steiger’s store. 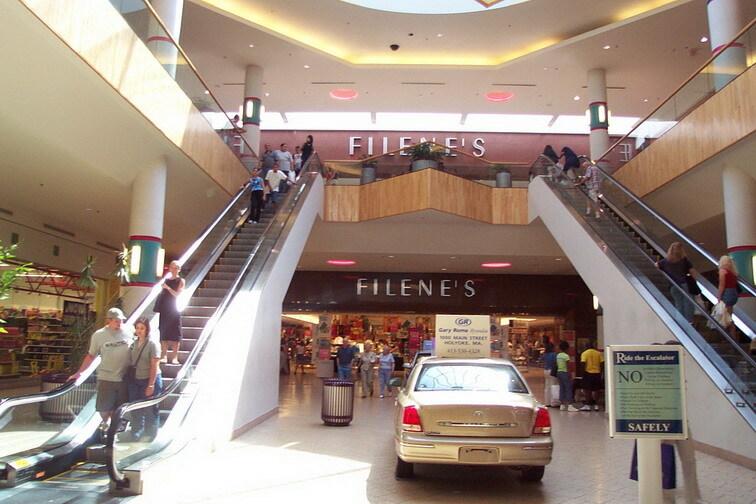 What is now Target(upper level)and Sports Authority(lower level)use to be Filene’s, and before that, it was G.Fox. Also, on the upper level across from what was then G.Fox there was a store called Haagen-Dazs which is a ice cream company. My recollection is that this mall actually struggled a bit in its early years. I lived in Hartford in ’79-’81 and the word on Holyoke was that it was too big for its market area. There was certainly a lot else going at that time and I think the town of Holyoke was not exactly doing well, itself. I’m curious if this was the more local sentiment/impression. I doubt that Holyoke was built with Hartford in mind, both because of Enfield Mall’s coverage of Springfield’s southern environs and because the sense of place in New England is so different from elsewhere. When I was there, Springfield was pretty much out of conciousness in Hartford, even for people in much of north suburban Hartford and the same could be said for New Haven, even with Macy’s. People were far more likely to make an excursion to NYC or (less often) to Boston than to bother with any adjacent areas. The only time I remember going to the Springfield area (other than to change trains on Amtrak) was to visit Riverside amusement park in Agawam, which drew from a very wide area (there was simply no competition). Another thing I remember is that they used to have color-coded entrances. (ie Blue, Yellow, Green). They for the most part did away with those in 1995, except for the yellow entrance near JCPenney, that might still be there. They really need to renovate this mall and take out those stupid neon lights. It’s funny because my closest mall (Tysons Corner Center) hasn’t been remodeled in nearly 20 years and doesn’t look nearly as dated as this one does. What was the record store called that was in place before F.Y.E.? I can’t think of the name for the life of me. Thanks! 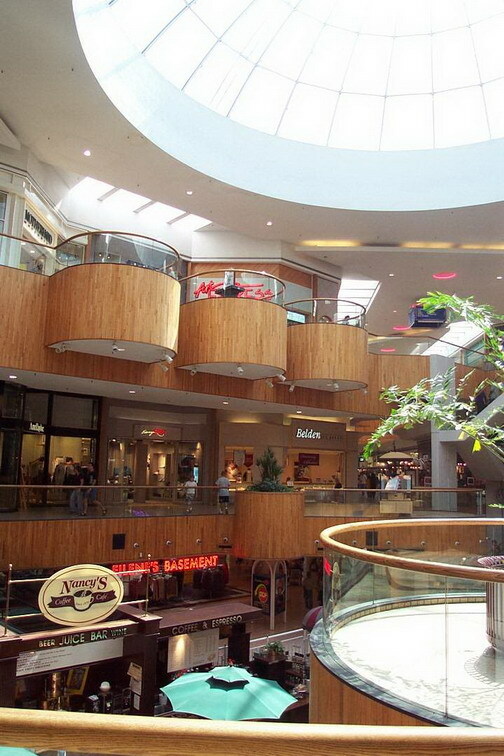 The Hampshire malls survives since it is relatively close to UMass which is a relatively large university, Amherst College, and Hampshire College. The mall provides essential stores for students with a new Target as an Anchor and a Dave Barry’s. I just went to this mall a couple of weeks ago. It’s strange how there are both a lot of fairly upscale retailers ( Banana Republic, Guess, Apple Store, Solstice) and a lot of mom and pop shops (How many sports memorabilia stores are there in this mall anyways?) The top half of the former Lord & Taylor location will be split between a Borders store and a Pottery Barn with a really short hallway inbetween – a very Pyramid-like solution. Also a Sephora store and a Williams-Sonoma store is coming soon too. I guess there is a fairy upscale clientele in the mall, considering these stores are opening soon, despite the fact that Holyoke is not the wealthiest town in the area. Wow–that waffle cone place! Yeah, what was its name? (I don’t believe that it was HD). Getting one of those was a real treat back in the day. 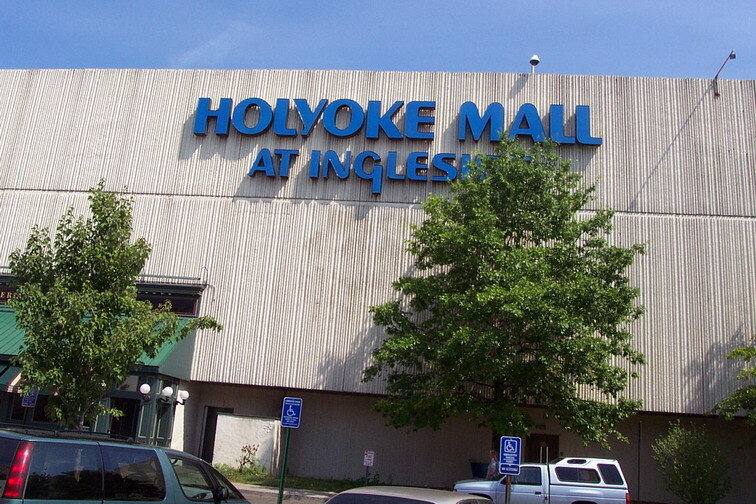 I, too, have memories of the Holyoke Mall causing quite a stir when it opened, but also it seemed to struggle a bit. Perhaps it took a while for those who were accustomed to going out to Eastfield, to Downtown Springfield, or to the Enfield Mall to make that switch (if I remember, these places mostly had the same stores as Holyoke). Also, there was a lot of anxiety about the building’s construction quality very early on. Am I the only one who remembers some kinds of parking lot sinkholes and things falling inside the mall? I’m still surprised that the mall doesn’t have a Crate & Barrel. Back in the late 1980s I think part of Sears actually caved in. I would bet this is still true today – there are huge cracks on the bottom level of the mall and some people say they can feel the structure shake in the basement food court (although I never experienced that and I practically lived there when I was in High School). I remember about 10 years ago Pyramid wanted to expand this mall out even more after just coming off the heels of the expansion that opened in 1995 – but it got shot down. To tell you the truth, I think for the store selection it has – its one of the best malls in the country because it has a little bit of everything. No, you’re not the only one who remembers the sinkholes in the parking lot near Sears and maybe some structural problems in Sears also. I don’t know if anyone ever checked the property before purchasing it but the mall is built on my Aunt’s dump that was leased to the town. It’s not surprising that there would be some settling underground. I never realized it was the largest mall in New England so I’ve learned something too. I haven’t been there in a long time, will have to check it out when I’m in the area. i live there. they arent really strict about anything. kinda lazy. and its not very beautiful. but its a cool place to hang out. im always there. i actually work at old navy there. I paid my first visit to this mall a couple weeks ago, and I was very impressed. The 70’s decor and wood trim throughout kind of remind me of what Crossgates Mall in Albany looked like pre 1994. I didn’t try to take pictures of the mall, even though I wanted to. I ended up forgetting my camera anyway. Maybe I will head back someday and try for pictures. I can definitely agree that this mall has a huge security force compared to the other Pyramid malls I have been to. I saw them at practically every turn. Does this mall have a lot of crime activity? I also noticed the whole electronics department in Sears was enclosed in glass. Overall the mall had a nice vintage feel to it and I am glad that the decor has survived through the years. I live in VT but go to this mall fairly frequently (probably twice a year) It’s a pretty quick zip down I91 for me. can anyone help me remember the name to a sports memoralibia store on the second floor near the escalators or stairs. When I was younger I bought an Kobe Bryant autographed picture from there in 1996-1997 when I was headed to Umass basketball camp that year. Ive been down there from VT where I live also almost every summer and I cant remember the name of that store ?? It’s a great mall — too bad I don’t go there often because it’s quicker to get to Hampshire mall by bus. I do miss Pizzeria Regina though. 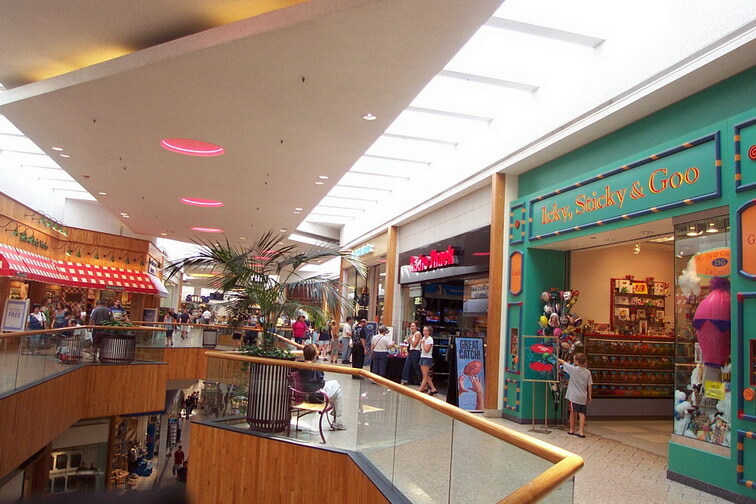 I worked at Kahunaville from April of 2000 to September of 2004 and really got used to the mall. I still shop there. What the Mall needs is more family restaurants or maybe a Dave and Busters. Definitely a second Candy store(I admit I have a BIG sweet tooth)or a bigger location for icky sticky and goo( 🙂 if you crave Jelly Belly Jelly Beans,even the funny flavors from the Bertie Botts Every Flavor Beans)and maybe an arcade,definitely a full sized Japanese Restaurant,(all Sushi lovers out there would like a better selection than the limited one at Shoyu)and maybe a barbecue joint( the smell of the meat cooking would draw the Customers by the bushel). @Mike Gallant, icky sticky and goo is gone. I miss the Lindt chocolatiers that used to be at the mall. Pyramid should try to get an upscale Chocolatier into the mall again. When I was younger, my dad took me to York Steak House,and another time we went to the Cinema that was in the mall to see An American Tail,and my mom and I went there to see the first of the 2 Short Circuit films. I’ll never forget the day that lightning hit the mall and knocked a few store’s power out for a wee bit, this during my years at Kahunaville. They should get a better Italian Restaurant than Sbarro;-) if you love thin crust new york style with no Anchovies in sight and veggies on it if you’re like my mom. I love the Williams Sonoma place but they could stand to lower the prices. I think this mall needs a pc Game Shop with a Better selection than Gamestop or Best Buy. Also I would love if a buffet Restaurant moved in to the mall. Clean out an old store or two and they could have a Mega-Buffet type of place move in! One thing that would be cool is if they put a new bookstore in the mall again,I mean why should B&N have all the Glory. Also a thrift store like Savers would be great! Icky,Sticky and Goo is no more! This was the closest mall from where I grew up and I have quite a few memories of this place. We didn’t go often so whenever we did it was a rare treat. Mainly that was because after the shopping was done we would go and buy a giant cookie and soda from Mrs. Fields or candy from Icky, Sticky and Goo and/or maybe be allowed to buy Pokemon cards at the Sport & Card Store (I forget what it was called). Over time the Mrs. Fields closed and sometime after I had outgrown pokemon cards and stopped going the Sport & Card store closed too. When I there last Icky Sticky and Goo was gone too. It’s sad because while it still has a lot of good stores those held childhood nostalgia to them and something I still looked forward to as an adult. 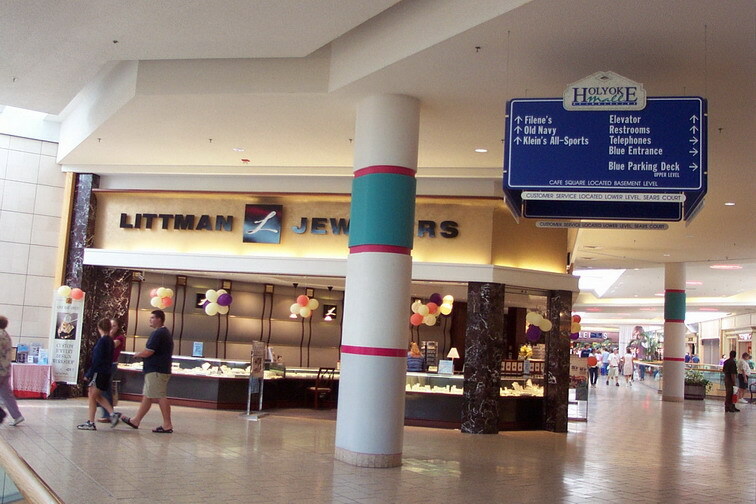 I have many photos of this mall from the early 1990’s. I have quality pictures of the entrances to G. Fox, Mikasa, Kahunaville, Babbages (pre-Gamestop, Kay-Bee Toys, Service Merchandise, and a few others. They are all from before the mall expanded in 1995. The waffle cone place on the second floor was a test site for something Friendlys was considering. Alas, it was viewed as too labor intensive, since they added mixins to the ice cream. Today, Coldstone Creamery used the same concept. Those Waffle cones sure smelled good!